People have often criticized Mrs. Beeton for the enormous quantities she recommended in her recipes: take six fowl, two dozen eggs, 4 lbs. sugar and so on. When we started work on The Shorter Mrs. Beeton, we were pleasantly surprised to find that her recipes were mostly modest in scale and perfectly suited to a modern family. In the case of her medium stock, however, you do really need a two-gallon pan. Having ordered a medium chicken from Farmdrop, along with an impressive array of farm-fresh vegetables, we were surprised to find that it was what any normal person would call a large chicken. Even after providing a roast for six people and making two other meals, it still had an impressive amount of flesh. 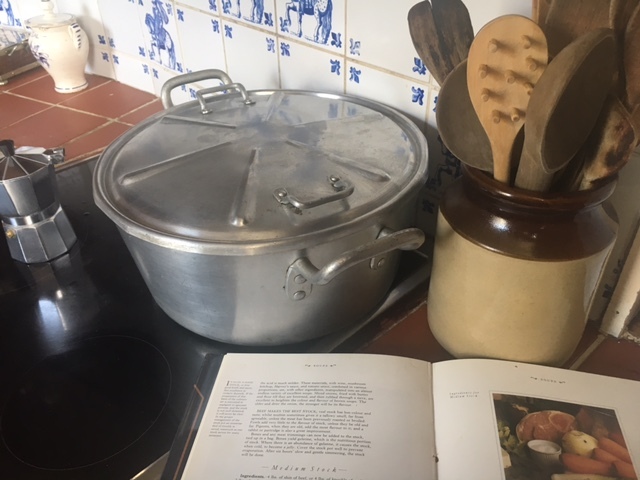 We decided, therefore, that we should use the carcass to make medium stock, since, as Mrs. Beeton said, ‘It is on a good stock that excellence in cookery depends’. We feel it is proof of their usefulness that we turn to our own cookery books in the kitchen, even if they were written in 1861! This is how, according to The Shorter Mrs. Beeton, a medium stock is prepared. Ingredients. – 4 lbs. of shin of beef, or 4 lbs. of knuckle of veal, or 2 lbs. of each; any bones, trimmings of poultry, or fresh meat, ½ lb. of lean bacon or ham, 2 oz. of butter, 2 large onions, each stuck with 3 cloves, 1 turnip, 3 carrots, ½ leek, 1 head of celery, 2 oz. of salt, ½ teaspoon of whole pepper, 1 large blade of mace, 1 small bunch of savoury herbs, 8 pints and ½ pint of cold water. Mode. – Cut up the meat and bacon or ham into cubes; rub the butter on the bottom of the stewpan; put in ½ pint of water, the meat, and all the other ingredients. Cover the stewpan, and place it on a moderate heat, occasionally stirring its contents. When the bottom of the pan becomes covered with a pale jelly-like substance, add 8 pints of cold water, and simmer very gently for 5 hours. Skim off every particle of fat whilst it is doing, and strain it through a fine sieve. This is the basis of many soups, and will be found quite strong enough for ordinary purposes. Time. – 5 ½ hours. We didn’t have the shin of beef or the knuckle of veal, but the rest of the recipe has produced a very good stock made entirely from fresh ingredients. It will be used instead of stock cubes in the celery and celeriac soup we plan to serve at our annual Guy Fawkes party.